If the humanistic filters of Calvin's T.U.L.I.P. are applied to the most quoted verse in the entire Bible, this would be the sad results. "For God so loved some of the world ("Unconditional Election") that He gave His only begotten Son, that just a select few ("Limited Atonement") who are made to believe by God's unconditional predestination ("Irresistible Grace") will be once saved always saved ("Perseverance of the Saints") and cannot possibly lose their everlasting life because they are not free to make freewill choices." Far too many start with Calvin and make the Bible adapt to his views. Others start with the Bible and quickly discover that many of Calvin's views cannot adapt to the Bible. Man cannot be trusted with the greatest message of all time. In order to be sure of God's message, always let the Bible interpret the Bible. Can the Bible be trusted? There are two major views of the providential preservation of the Bible record. One group believes that God preserves biblical accuracy in spite of human influence. The other group believes that He preserves accuracy because of human influence. The great irony is this, the same ones who teach that humans are "totally depraved" are the ones who depend upon human influence in order to know God's will (Calvinism, Catholicism, etc.). Warning! It is a very slippery slope to conclude that God requires human editing in order to keep His Word accurate. In response to this humanistic accusation against the purity of Scripture, I would like to offer you several promises from God. Matthew 24:35 (NIV) "Heaven and earth will pass away, but my words will never pass away." Mark 13:31 (NIV) "Heaven and earth will pass away, but my words will never pass away." Luke 21:33 (NIV) "Heaven and earth will pass away, but my words will never pass away." Proverbs 30:5-6 (NIV) "Every word of God is flawless; he is a shield to those who take refuge in him. Do not add to his words, or he will rebuke you and prove you a liar." But perhaps the most explicit teaching on the trustworthy nature of Scripture comes from the inspired words of Peter. 1 Peter 1:23-25 (NIV) "For you have been born again, not of perishable seed, but of imperishable, through the living and enduring word of God. For, 'All people are like grass, and all their glory is like the flowers of the field; the grass withers and the flowers fall, but the word of the Lord endures forever.'" I realize that I have quoted Scripture in order to validate the accuracy of Scripture, but that IS the point. Let's revisit the original statement of this article, "There are two major views of the providential preservation of the Bible record. One group believes that God preserves biblical accuracy in spite of human influence. The other group believes that He preserves accuracy because of human influence." The question is this; "To which group are you loyal?" I find it perversely ironic that the same group who preaches "faith only" can't seem to muster enough faith to trust that God can preserve the accuracy of Scripture without human input. Beware of the doctrines of human filtering which dominate the hermeneutical agenda of Calvinism, Reformed Theology, Catholicism, Mormonism, Jehovah Witnesses, Islam, etc. In order to be sure of God's message, always let the Bible interpret the Bible. 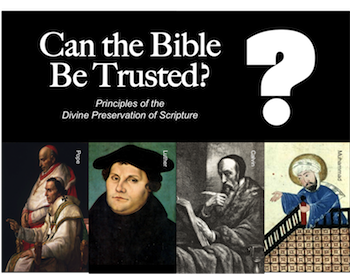 Can the Bible Be Trusted? "Part 2"
Back to Top of "Can the Bible Be Trusted? Part 1"